Leadership Blind Spots - What Do You See? - Innolect, Inc. | Innolect, Inc. 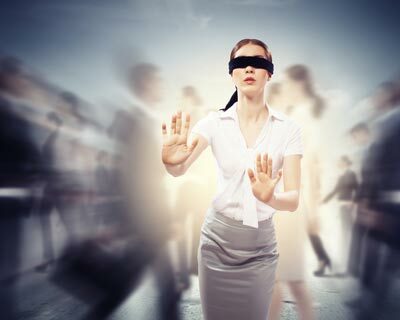 Leadership Blind Spots – What Do You See? We are grateful that the latest automotive technology helps drivers detect when another car and/or a person is in their blind spot. These devices help warn against changing lanes or backing up and have dramatically reduced the number of accidents. Unfortunately, there are no devices that help leaders notice their own blind spots when it comes to understanding and/or demonstrating empathy for those with diverse life experiences, thinking styles and/or backgrounds. Blind spots are a natural part of the human condition. In fact, optometrists describe “Blind Spots” as a scotoma, or a small area in the eye where no vision is present. Every person has a tiny gap in the retina. Our brains ignore what is missing and fill in the gap with other visual information. Since we are unaware of our own blind spots, we don’t realize what we’re missing because we literally don’t see it! Unfortunately, knowing we have biases isn’t sufficient. After training, for example, leaders acknowledge that bias can have a major impact on decision making, but few acknowledge that their biases influence their own decisions. So, what are we to do? As leaders, we must monitor our own behavior, develop greater empathy for those who think differently, and make sure that everyone gets to have a say, is listened to and feels heard. To learn more about how to develop these key skills, contact Harry Hutson.